After Sony Pictures canceled the Christmas Day release of The Interview, following terrorist threats similar to the 9/11 attacks, the studio also announced that they have "no further release plans for the film", which has many wondering if the movie is delayed indefinitely, or if it will be put on the proverbial shelf forever. 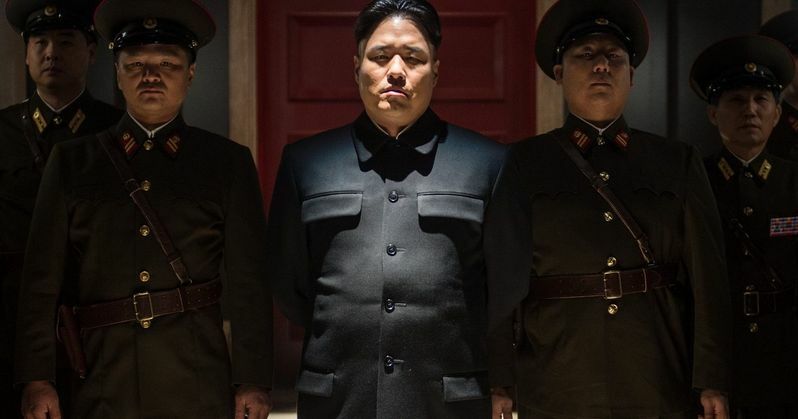 In the film, Seth Rogen and James Franco star as a producer and TV journalist who are asked to kill Kim Jong-Un (Randall Park), after they secured an interview with the North Korean dictator. While it remains to be seen if and/or when the full film will be released, the death scene has been leaked online, which some believe may have been the reason for the massive Sony hack in the first place. Gawker originally released the clip on Monday, which the site later removed, but the scene has surfaced again, showcasing the fiery death of the North Korean leader, set to the Katy Perry hit song "Firework." A New York Times article reveals that this scene in particular caused Sony's chief executive, Kazuo Hirai, to break a 25-year tradition by intervening in a Sony Pictures decision, which has long been autonomous from its parent company. The executive insisted that the death scene be toned down, removing images of Kim Jong-Un's flaming hair and chunks of his skull after the explosion. Seth Rogen, who co-directs with Evan Goldberg and stars in The Interview, and Sony Pictures' Amy Pascal sent Hirai three different versions of the death scene, one which was vetoed by Hirai, another which was vetoed by the directors and a third, dubbed "shot #337," in which, "there is no face melting, less fire in the hair, fewer embers on the face, and the head explosion has been considerably obscured by the fire, as well as darkened to look less like flesh." On September 29, Hirai approved this version, but asked Amy Pascal to tone down the violence even further, with a caveat that this scene cannot make it into the film's international version. Amy Pascal did press for Seth Rogen to tone down the scene even more, which he did, stating in an October 6 email that they removed, "fire from the hair" and "the entire secondary wave of head chunks." The filmmaker/star added, expressing his apparent exasperation with the process, "Please tell us this is over now." While it isn't known if or when fans will ever get to see this scene on the big screen, you can take a look at the leaked clip below, showcasing the death of Randall Park's Kim Jong-Un. What are your thoughts about this death sequence? Chime in with your thoughts below.